Stack up 5 colourful pieces, then drop three balls down the center. Each stacking block has a clicking or rattling activity designed to encourage exploration and hone in on fine motor skills. 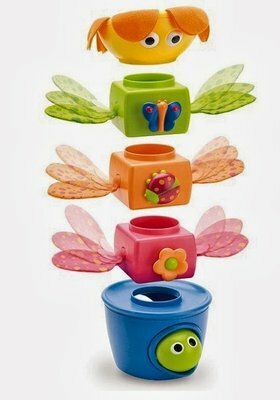 This is a wonderful stacking toy with great entertainment value for any children. I use it successfully in therapy with children aged from 18 months.